The Pirastro P341200 Flexocor Solo Double Bass E String offers a reliable tone for the gigging musician. The rope core produces a balanced sound with a versatile response, making it ideal for students still developing their skills. The medium gauge tension has an optimum balance between a versatile sound and easy playability. The chrome steel winding adds a durable coating to your string for long lasting reliability. This E string features a ball tailpiece end and is designed to fit 3/4 size double basses. 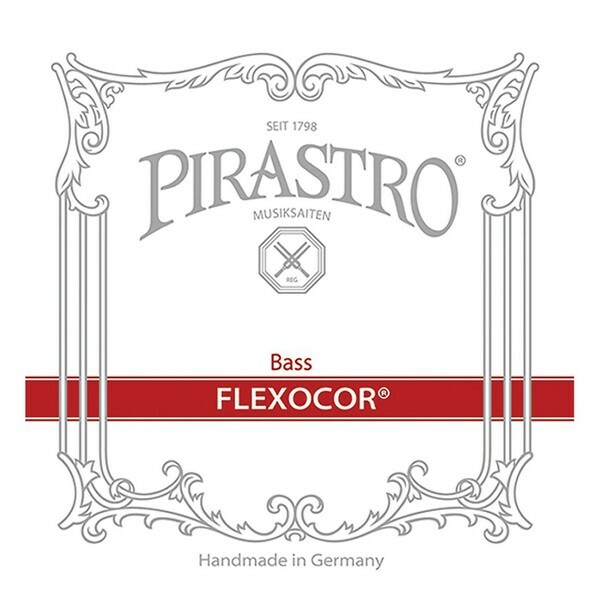 The Flexocor string series offer musicians versatile playability and a comfortable feel. The strings have a rope core made from carbon steel, which is both flexible and has a loud projection. Because of the flexibility, there is access to a wide range of tonal possibilities as the steel is sensitive to subtle nuances in your playing. Each string is chrome wound for extra brightness and a comfortable feel. The medium gauge tension offers the optimum balance between versatility and playability. This string model is ideal for musicians who require clarity and precision.